A couple of weeks ago, I wrote that, more often than not, remastered versions of beloved games do little other than highlight the massive gulf between cherished memories and the actual quality of the game being remastered. 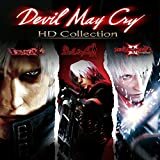 Apropos of that, here’s the Devil May Cry HD Collection getting released on modern-gen consoles. Before I go any further, I’ll note two things. First, this is the second generation in a row in which the DMC HD Collection has been released, since it also came out on PS3 and Xbox 360 back in 2012. Second, on a more personal level, I should admit that I don’t have anything in the way of cherished childhood memories for the original games, since they came out during a period in which I’d mostly lost interest in gaming. To take that latter point further, I should also add that what really got me into the series was DmC: Devil May Cry, the somewhat-reviled 2013 reboot. While I don’t see that game’s portrayal of Dante as being hugely far off from the way he was portrayed in earlier games, apparently there’s some distinction between the two that needs to be acknowledged, for whatever reason. I mean, they seem a little different, I guess, but it anything, I found the more modern Dante to be a much better character, in that he didn’t seem nearly as cringe-worthy. In fact, I’m going to take that sentiment one step further, and say that I found the rebooted DmC to be far better than anything you’ll find on the HD Collection, since everything here seems incredibly dated. It starts, of course, with the music and the fashion. Nearly every aspect of the game feels like it was conceived in some post-Matrix haze of leather, sunglasses, and chugging, vaguely metal-influenced guitars — which, of course, it was, seeing as the games originally came out between 2001 and 2005. You don’t want to dismiss a game just because it looks like the product of another time and place, but, at the same time, it’s really hard to take anything here seriously when it feels like such a relic. Devil May Cry HD Collection looks like a relic, too. The newest game in the collection came out about a dozen years and two generations ago — and it looks like it every step of the way, since at no point does the game make it obvious what it’s done to deserve the “HD” of its moniker. Everything is blocky and hideous, and the effect is exactly what you’d expect if you were to hook a PS2 game up to a modern TV. I’m not one to worry about things like 1080p or refresh rates or whatnot, but when a game is so ugly that I call my wife in from another room to show her how bad it looks, to me that’s a sign that something has gone horribly wrong. That said, Devil May Cry HD Collection’s issues run far deeper than simply looking like a refugee from the turn of the century. For a game that, in its time, was renowned for its stylish combat and lightning-fast gameplay, it’s striking to see how awkward and disjointed it all seems now. Character movements are slow, the controls are clunky, and hacking and slashing seems much jerkier now than it apparently was a decade ago. Probably the worst thing about the HD Collection, though, is the camera. It’s simply awful. All three games here are fond of quick cuts, which makes placing your character in a 3D space incredibly difficult. You can be walking down a hallway, only for the camera to abruptly shift position to a new angle, which means that you’re suddenly walking backwards. It does things like this constantly, which forces you to slow down — which may be ideal in a game where you’re supposed to move slowly and take in the atmosphere, but in a game built around moving quickly and smoothly as you slice through enemies, it’s torture. And that, in a nutshell, is the perfect descriptor for Devil May Cry HD Collection: torture. I don’t know what your memories may be telling you about these games from 10-15 years ago, but I can tell you that if you play them now, it’s likely to leave you wondering how they could have become so beloved in the first place, with fresh eyes, the games won’t come off nearly as well. * If you have fond memories, keep them there, rather than allowing them to become sullied by this hideous abomination. *Changed because it was pointed out this line may have been overly harsh. Capcom provided us with a Devil May Cry HD Collection PS4 code for review purposes.